Today I have another Nicole by OPI Kardashian Kolor to share with you! 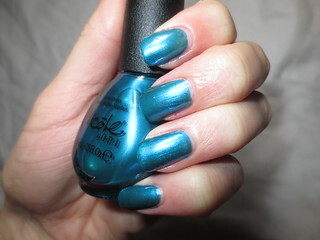 Deck the Dolls* is a beautiful teal, ocean blue. In the bottle, this polish reminded me of OPI's Swimsuit... Nailed It!, which is one of my favourite polishes. Needless to say, I was excited to try it out. Deck the Dolls is a really beautiful aqua blue polish, and I think it would work well year round. This shade just shines in the sunlight, this would be such an amazing summer shade. The formula for this polish was good, I used three coats for an opaque finish. The first two coats were slightly sheer, so the third coat was definitely needed for a richer look. This polish does contain a light amount of shimmer, but I didn't find that it was all that noticeable once painted on my nails. This polish is very metallic, but I don't find that it comes across looking streaky. I used two coats of OPI's Nail Envy Maintenance for my base coat, just to ensure that I wouldn't be left with stained nails, or smurf hands. I haven't removed this polish yet, but I'm really hoping it won't stain! I've been enjoying wearing this polish for that past couple of days, but I don't think that it's incredibly unique. If you already have a shade like this in your stash, I would say skip this one. If you don't already own a similar shade, then this would make a great option, and you can normally find Nicole by OPI polishes on great sales! Pretty! I've got All Is Glam, All Is Bright, A Gold Winter's Night, and Kardashing Through The Snow. At least that's what I have so far, hee hee!